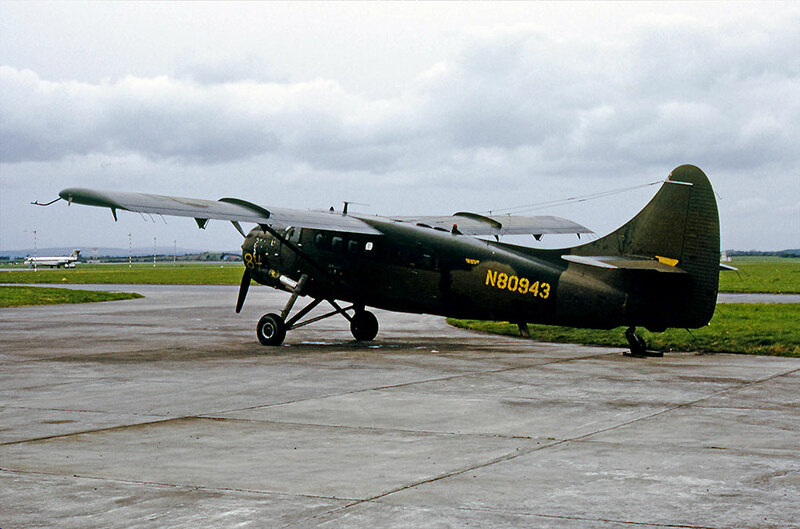 N80943 at Shannon - EINN, Ireland. CF-JIK at Red Lake, Ontario. • 57-6110 United States Army. Delivered 13-Dec-1957. Designated as U-1A. Initially to Addison, TX., to be fitted with a radio package suitable for Europe by Collins Radio Corporation. Circa 1958. Deployed to Europe. Jan-1962. At Coleman Barracks, Mannheim, Germany. Jun-1962. 2nd Aviation Company, France. Jul 1963. Returned to storage at Coleman Barracks, Mannheim, Germany. Jan and Feb-1964. TUSLOG Det 4. Sinop Army Airfield, Turkey, an intelligence gathering station on the South side of the Black Sea. Mar-1964. Coleman Barracks, Mannheim, Germany. Jun-1964. Allocated to the 394th Transportation Battalion, Nelligen, Germany. Sep-1969. 3rd Armoured Division Bonames, in Germany. Jan-1971. Coleman Barracks, Mannheim, Germany and withdrawn from use. Oct-1971. Removed from Army inventory. • N80943 Ferrer Aviation Inc., Miami, FL. Canx 12-Jun-1972. • CF-JIK Northland Fisheries Ltd., Winnipeg, MB. Purchased 31-May-1972. Regd 11-May-1973 after storage and refurbishment and conversion to civilian configuration. • CF-JIK Leased to Ilford Riverton Airways Ltd., Winnipeg, MB. Regd 07-Aug-1973. until Feb-1975. • CF-JIK Patricia Air Transport Ltd., Sioux Lookout, ON. Regd 09-Dec-1975. Note: The aircraft was partly purchased with a mortgage which was defaulted on. The aircraft was recovered by Northland and re-sold to Smithers Air Service. • CF-JIK Smithers Air Service (1974) Ltd., Smithers, BC. Regd 24-May-1978. Accident: Leo Creek, Takla Narrows, BC. 26-Nov-1979. The aircraft was overloaded with three passengers and a large amount of empty beer bottles on a return flight to Smithers. On take-off the aircraft encountered a nose up pitch, followed by a stall after which it fell to the ground. It burst into flames. The pilot escaped but the passengers died in the fire. See report below. Otter 229 was delivered to the United States Army on 13th December 1957 with serial 57-6110 (tail number 76110). It was one of sixteen Army Otters flown from Downsview to Addison, Texas for work to be done on them by the Collins Radio Corporation. Most of these Otters were then assigned to Europe. By January 1962 76110 was in storage at Coleman Barracks, Mannheim, Germany as a maintenance float. In June '62 it was issued to the 2nd Aviation Company, France where it served until July 1963, then returning to storage at Coleman Barracks. During January and February 1964 it was based at Sinop Army Airfield in Turkey, again returning to storage at Coleman Barracks. In June 1964 it was allocated to the 394th Transportation Battalion, Germany where it served until September 1969. It then served with the 3rd Armoured Division in Germany, noted at Bonames in June 1970, until January 1971 when it returned to Coleman Barracks where it was withdrawn from use and parked out in the open. It remained on the Army inventory until October 1971 when it was put up for disposal. $41,600 was the price for 76110, which had 3,027 airframe hours at the time of sale, the lowest time of the eight. 76110 was allocated marks N80943 for Ferrer Aviation, who contracted ferry company Air Convoy to fly the eight Otters to Canada. All followed the same route, being first flown from Coleman Barracks to Saarbrucken. They then set off, two at a time, to Ashford in Kent. On 7th April 1972 N80943 (ex 76110) flew in company with N80941 (ex 76111) from Ashford to Shannon, Ireland where ferry tanks were fitted by SRS Aviation. Having been at Shannon for some weeks, the two Otters continued on to Reykjavik, Iceland on 20th May '72 and then on to Greenland and Goose Bay to Winnipeg, a mammoth delivery flight which took 40 hours flying time. On 31st May 1972 by Bill of Sale of that date, Ferrer Aviation sold N80943 to Northland Fisheries Ltd., of Winnipeg and the American registration was cancelled on 12th June '72. The Otter remained parked at Winnipeg until April 1973 when work started on the aircraft by Perimeter Aviation at their hangar, to convert it to civilian configuration, overhaul and repaint it. On completion of this work, it was registered CF-JIK to Northland Fisheries Ltd on 11th May 1973. After use by them that summer, it was leased to Ilford Riverton Airways Ltd., to whom it was registered on 7th August 1973. Ilford Riverton Airways were a Winnipeg-based airline serving the Manitoba north country, their Head Office being Hangar 4 at the Winnipeg International Airport. The Otter joined their fleet of two Douglas DC-3s, a PBY, Beaver, Norseman and some Cessnas, serving alongside Otter C-GCQK (141), another of the ex-Army Europe Otters which had been purchased by Ferrer Aviation. Otter JIK continued in use until February 1975, when it was returned off lease to Northland Fisheries Ltd. 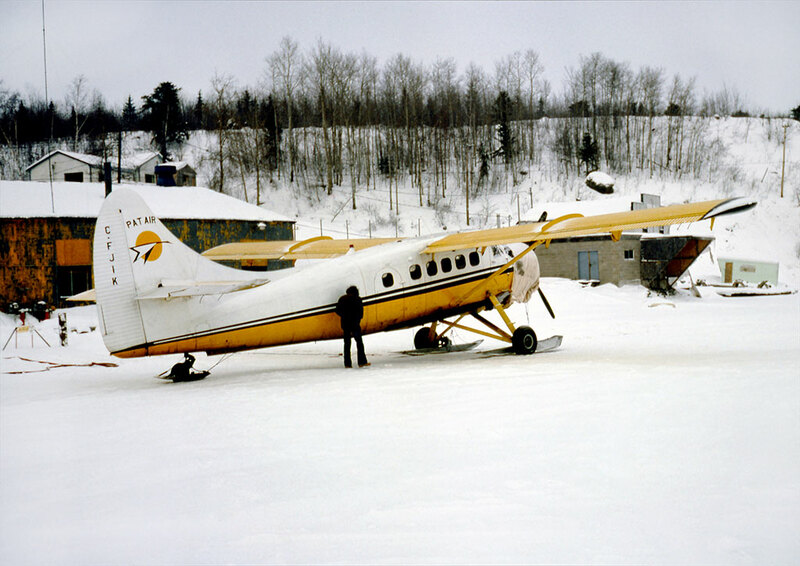 The Otter was then sold to Patricia Air Transport Ltd., of Sioux Lookout, Ontario to whom it was registered on 9th December 1975. Money remained outstanding to the seller, and a mortgage was executed over the aircraft to secure the sum due. Patricia Air Transport also operated Otter C-GLCT. (430) and its fleet included a DC-3, Twin Otter, some Beavers and Cessnas, an Aero Commander 690 and a Saunders ST-27. Otter JIK with Patricia Air Transport, although the following year the company appeared to encounter financial difficulties. In court proceedings by Northland Fisheries Ltd., against Patricia Air Transport, on 11th March 1978 Action Credit Adjusters of Canada could report that they had been successful in seizing the Otter back from Patricia Air Transport on foot of the mortgage, and that it was now parked at Gimli, Manitoba. By Bill of Sale dated 11th May 1978, Northland Fisheries sold the Otter to Smithers Air Service (1974) Ltd., of Smithers, BC to whom it was registered on 24th May 1978. CF-JIK was still flying for Smithers Air Service when it crashed on 26th November 1979 at Leo Creek, Takla Narrows, BC., some one hundred and ten kilometres north-east of Smithers, a small dirt strip two thousand feet long by one hundred feet wide. It was a classic case of over-load. The Otter had been chartered to carry three passengers and a stove to a remote hunting and fishing lodge. On the return flight to Smithers, the environment conscious passengers elected to take their empty beer bottles with them, all 250 to 300 cases. One passenger was in the cockpit, the other two occupied the first row of seats and the rest of the aircraft was filled with empty beer bottles. Immediately after lift off, the aircraft pitched to a steep nose-high attitude which the pilot was unable to prevent or correct. It then stalled and fell to the ground. A severe fuel-fed fire erupted on impact and gutted the aircraft. The pilot was thrown clear but the three passengers died in the fire. The accident investigation determined that there were no less than 4,773 bottles on board. A weight and balance calculation on this discovery indicated that the gross weight of the Otter was 637 pounds over the maximum, with the Centre of Gravity eleven and a half inches aft of the rear limit. Calculations made by DHC showed that an Otter will run out of elevator control with the C. of G. four inches aft of the rear limit. The pilot had estimated that a dozen bottles weighed 3 to 4 pounds when the true weight was 7 pounds. The pilot of the Otter was Emil Mesich, who was the owner of Smithers Air Service. The crash caused the company to cease trading and go into receivership. Pilot Mesich was then employed by Central Mountain Air Services Ltd., also based at Smithers. He was the pilot of Otter C-FDJA (459) of Central Mountain Air Services when it crashed near Smithers on 18th September 1982 and was sadly killed in that crash.